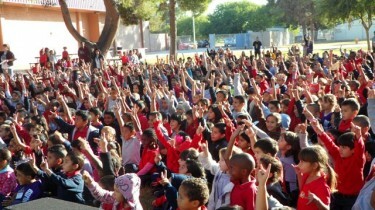 The students at Glenn F. Burton Elementary School know the “’Lopes Up” hand signal. They’ve got their share of GCU T-shirts, backpacks, Frisbees, pencils and notebooks. But their most valuable Grand Canyon University product? That would be Anthony Perez. Anthony Perez wore his GCU cap and gown for College Day at the elementary school where he teaches in Glendale, and he received a visit from Thunder and GCU's community outreach manager, Jose Moreno. Perez, who received his master’s in education from GCU in 2011, is finishing up his first year as a second-grade English Language Development (ELD) teacher at Burton Elementary in Glendale. When Perez started teaching in August, only six of his 23 students could read at or above their grade level. Today, that number is 19. The goal, Perez said, is to get as many of his students as possible reclassified so that they don’t have to take ELD classes. Perez was honored at a banquet Wednesday night as one of the rookie teachers of the year in the Glendale district. He also served on the English Language Development Committee for the district – the only first-year teacher who was asked. “He is all about wanting to make sure he is delivering the information and designing the lessons according to each student’s needs and learning styles,” said Dr. Marjaneh Gilpatrick, executive director of outreach for GCU’s College of Education. That involves working in conjunction with other teachers and parents and using technology that kids can relate to. “I went to his class one time and all of a sudden on a Smart Board there is SpongeBob talking about parts of speech or something,” Gilpatrick said. “He makes it relevant for them. Perez credits much of that to his education at GCU and the mentoring program of the Rodel Foundation of Arizona. As a student at GCU, Perez was named a Rodel Promising Teacher. These are “the best of the best,” Gilpatrick said, and they are mentored by a Rodel Exemplary Teacher in high-needs areas. Perez teamed up as a student-teacher with Raquel Mendoza at Burton Elementary, a partnership that eventually led to Perez landing a full-time job there after graduation. Perez, who got his undergraduate degree from Arizona State University before attending GCU, bleeds purple when it comes to being an alum. College Day was a big hit with students at Burton Elementary School. 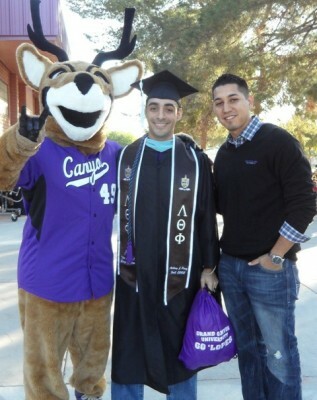 For College Day at Burton Elementary, Perez wore his GCU cap and gown. GCU’s community outreach manager, Jose Moreno, served as an emcee and ‘Lopes mascot Thunder entertained the kids while passing out GCU merchandise. Perez, 30, worked in the banking industry for a few years after graduating from ASU and spent the last seven years working in human resources for the Phoenix Union High School District. But it wasn’t his calling. “I just thought that it was really important to find a way to contribute to society, and this was a way to have the greatest impact,” Perez said of becoming a teacher. “I’ve worked in a school district, so I saw the good, the bad and the ugly. I saw what ineffective teachers do.